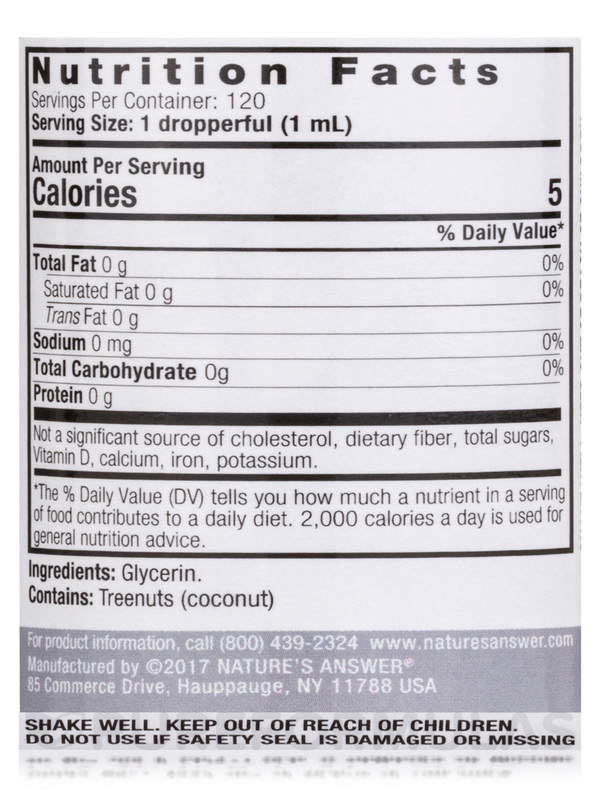 I was so excited to find Glycerine Pure by Nature's Answer derived from coconut instead of soy or corn! Pure offered a great price and you can't beat the shipping! Very happy to find Glycerine Pure Vegetable by Nature's Answer. I really try and stay away from soy based products and this is the only glycerine I found that is made from coconut and organic plus no alcohol. Pure Coconut Glycerin‚ moisturizes skin. Glycerin is hypoallergenic and soluble in water. With one of the most comprehensive herbariums in the world‚ Nature's Answer® has identified Mother Nature's unique botanical fingerprint on over 800 plant reference standards. Utilizing Advanced Botanical Fingerprint Technology™‚ these authenticated samples each serve as the standard by which all incoming raw materials are judged. Using carefully-controlled extraction techniques‚ Nature's Answer capture the holistic balance of each herb and the value is passed on to you‚ the consumer‚ who can be assured that the product in your hand is authentic‚ safe‚ effective‚ holistically balanced‚ and of course... Nature's Answer®. 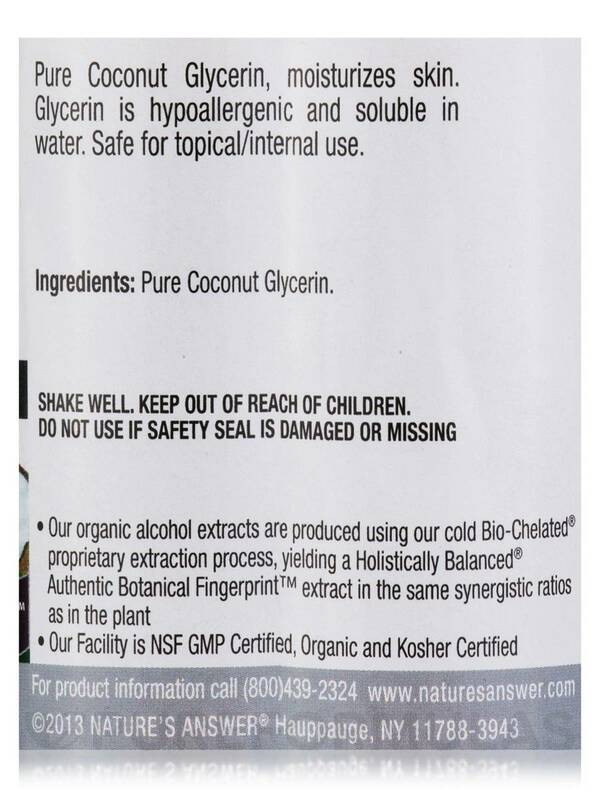 Nature's Answer facility is NSF GMP Certified‚ Organic and Kosher Certified. Shake well. Keep out of reach of children. Do not use if safety seal is damaged or missing. goodbye *FOREVER* to dry skin! 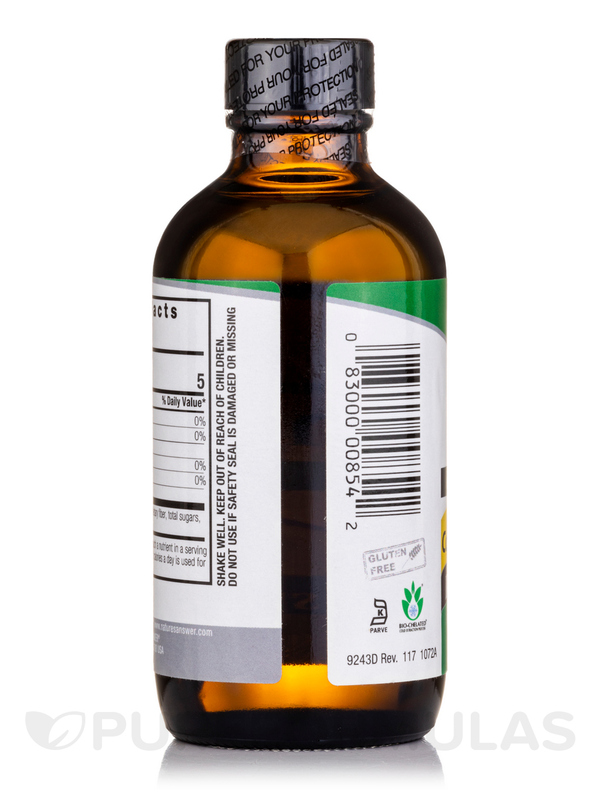 Glycerine Pure by Nature's Answer is one of the few times when the word "awesome" is truly appropriate. This stuff is, truly, awesome. Glycerine, by it's nature as a humectant, draws moisture from the air and naturally moisturizes. I put this stuff on my winter dry skin. They've been in the sun all summer, and the cold winter does them no favors. I get FLAKY skin. Before bed I'd put this on and in about 3 or 4 days my skin was actually moist to the touch, with nothing but using this on my legs! Yeah, it's a little sticky but it is non-staining, washes out completely - from anything and everything and the benefits are amazing! I was really amazed. It is great. The fact that it's coconut oil instead of vegetable makes it more appealing than the others. It's a great price and truly helps get rid of dry skin. Give it a try if you suffer from dry skin and watch it disappear! Got rid of dry skin. Great price, healthy! Glycerine is sticky so I generally use it at night before I go to bed. Its a safer product to use for my skincare. 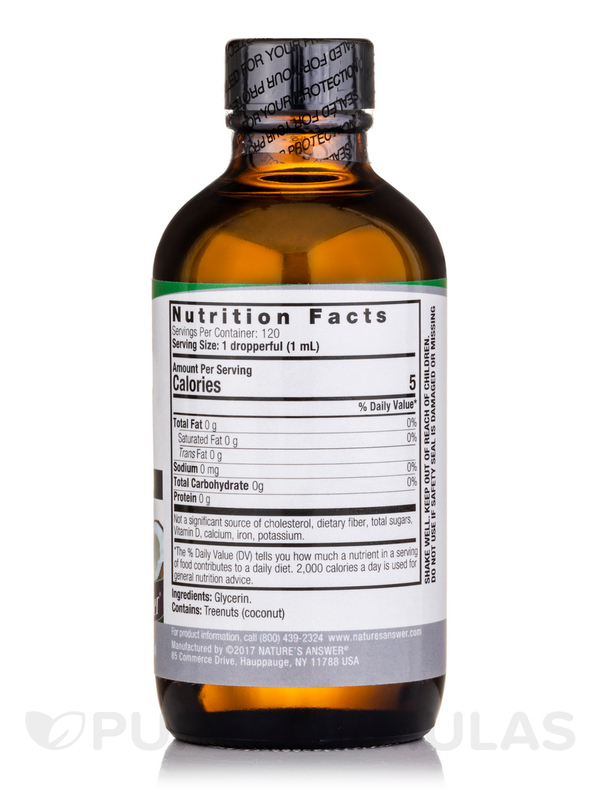 I am saving money by making my own glycerin tinctures. 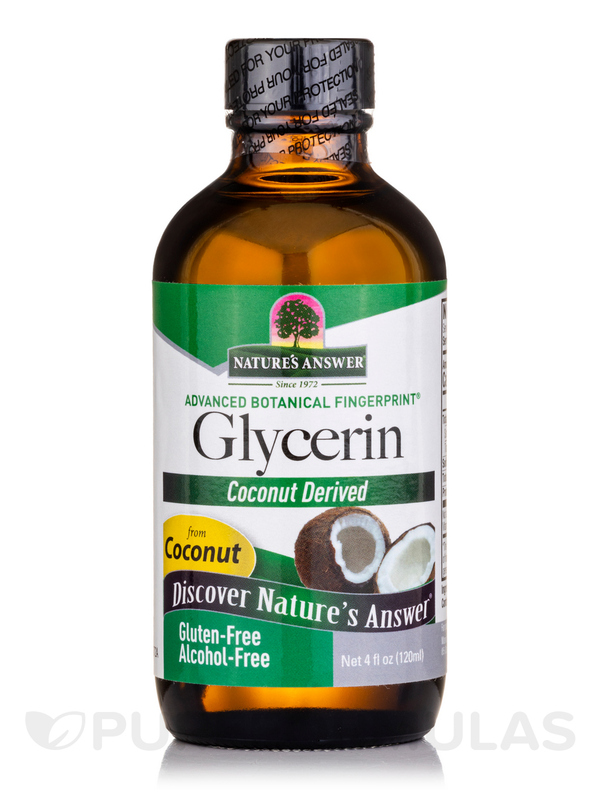 I love Glycerine Pure Vegetable by Nature's Answer because it is derived from coconuts -- the other vegetable glycerin products are usually derived from soy or palm oil, both of which I'd rather avoid. Derived from coconut the price. I use Glycerine Pure by Nature's Answer in my body wash for my skin. I like that it is coconut derived.